"Everyone who renders directly and honestly whatever drives him to create is one of us." thus spake the abstract painter... Words, emotions, reviews, point of views can not do complete justice to encapsulate a creative enquiry. At times it feels the work of art has broken out into a stream of melodies from the harping of images, brushstrokes, juxtaposition of elements and the streaming of colours impossible to imagine; they would be applied in that very way. Godavarthi Venkatesh has come a long way from As works on vibrant still lives ten years ago. 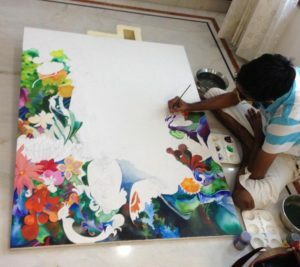 Venkatesh reaches out to add colour to his palette, as an innate spontaneous call. He has the ability to make flowers burst out in sprays of colour, in an enchanting garden that has an unique optical play as forms of trees, flowers and bushes developed in brush strokes, lines, dots and textures could be visualized from afar and near, simultaneously. In this sense As works gain an unusual dynamism as A collates opposing elements and juxtaposes them with great delicacy. His nature-scapes are often presented as if they are aerial views. depicting or evoking the appearance of a landscape from a perspective above it, usually from a considerable distance, as it might be viewed from an aircraft or spacecraft. This form of aerial view landscapes are found in ancient aboriginal paintings of Australia, as the painters would often climb up a higher plane and look at the landscape from a vantage point. Interestingly enough, many art forms use similar evocative vocabulary across art disciplines. Music, painting, drama and architecture use terms such as repetition, diversity, passion, cadence, conversation, equilibrium, harmony and so on. Some people can actually hear color, therefore they are easily influenced by music. Needless to say the delicate lines created by brush strokes and the application of strong colours, the demeanor of the human forms; essentially female forms, communicate through their expressions and movement of fingers and hands in Venkatesh's paintings. Their bodies melt into the vibrant garden becoming part of the landscape. The narrative of the expression and the undulating, abstracted land forms, the fibrous delineation in his works are a response to the serious learning of some of the painterly genres of the art historical panorama. The genres are actors donning the hat at different perspectives to evoke the story of art in his oeuvre. The human form in Venkatesh's work is very subtly played upon without much apparent distortions. The deployment of colors across all hues and tones do convey a variety of experiences. Throughout in his figurative images one does come across emotionally charged portraits in outdoors. Themes and styles from art history are studied in relation with his ruminations. Expressionists, colourists, fauvists, abstractionists and figurists jolt our senses and connects us to the journey of the artist. The representation of the artist's emotional response to a scene would form the basis of the Expressionists' artistic interpretations. 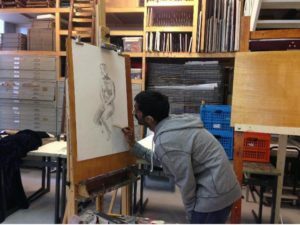 Venkatesh is living, absorbing creating and evolving his experience of art history. The theme of individual alienation hangs like a heady scent in the summery opus of Venkatesh's colour palette, and solo figures, or two people looking away from each other into the distance. Sifting through the point, his images make of solitude. Does music play though his art? Through the grass like split strokes through the spirals dashes, blobs and dots? Are they super codes to a secret melody within him? Does his brush tangos along the canvas playing jazz with colours while responding to this special music? Or are his paintings indicators of change of season around and within him? His works mirror his passion and he enjoys this dialogue as it creates a resonance of affirmation that there is rhythm, rejuvenation and resplendence in life.